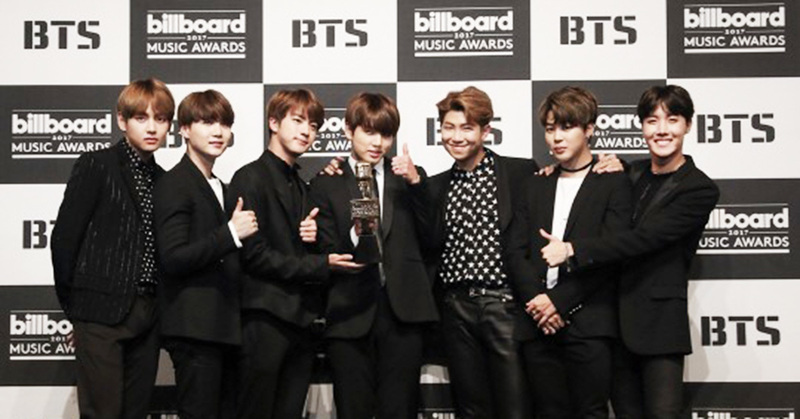 BTS will step on the pink carpet of ‘Billboard Music Award(BBMA)’ once again. Their name made it to the nomination list for two years in a row. BBMA announced the full nomination list of ‘2018 BBMA’ through their official homepage and SNS on April 17. 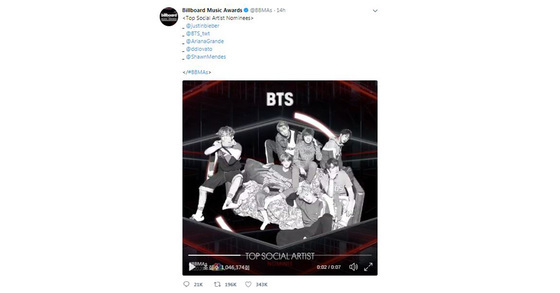 BTS is nominated for the ‘Top Social Artist’ sector. This award selects the nominees by measuring past one year’s album and digital song sales, streaming, radio airplay, touring and social engagement. BTS have especially been showing great strength in social engagement part. They have won No.1 in the ‘Social 70’ chart for 70 times. This time they have to compete against several global celebrities; Justin Bieber, Ariana Grande, Demi Lovato, Shawn Mendes are the ones BTS is nominated with. It is possible to expect BTS to win the award again after their first win last year. They won the ‘Top Social Artist’ award in ‘2017 BBAMA' held last May; it was a very first win from a K-pop group. '2018 BBMA' will be held in Las Vegas, US on May 20.